New York City Mayor Bill de Blasio announced Tuesday a new $136 million project dubbed ‘Made in New York’ at Brooklyn’s historic Bush Terminal. The proposed project will transform the area into a garment manufacturing hub and mixed-use campus for professional creatives, including those in the film and TV industries. The Bush Terminal campus is expected to create some 1,500 permanent jobs, as well as 800 construction jobs at the former shipping and warehousing facility. The project is a part of Mayor de Blasio’s plan to create 100,000 good paying jobs by 2026, including 40,000 within the next four years. “Good paying jobs are the bedrock of a strong city. We will continue to invest in the ‘Made In New York’ brand and in New Yorkers,” said de Blasio in a statement. The move to support garment manufacturing, which comprises 30 percent of the city’s manufacturing jobs and 5 percent of the city’s overall workforce, comes at a time when rising rents are forcing much of the industry out of Manhattan’s midtown Garment District. The new Brooklyn campus has space for 25 to 35 garment manufacturing tenants, including those working in sewing and patternmaking, as well as ancillary services like photography and educational support. SUNY’s Fashion Institute of Technology will launch two courses for makers at nearby Brooklyn Army Terminal, which will be integrated into the overall project. “It will be great to have an extension of Manhattan’s garment center in Brooklyn especially for new aspiring designers. Sunset Park feels like a breath of fresh air. The merging of fashion designers and manufacturers will energize our made in New York fashion community,” said designer Nanette Lepore. 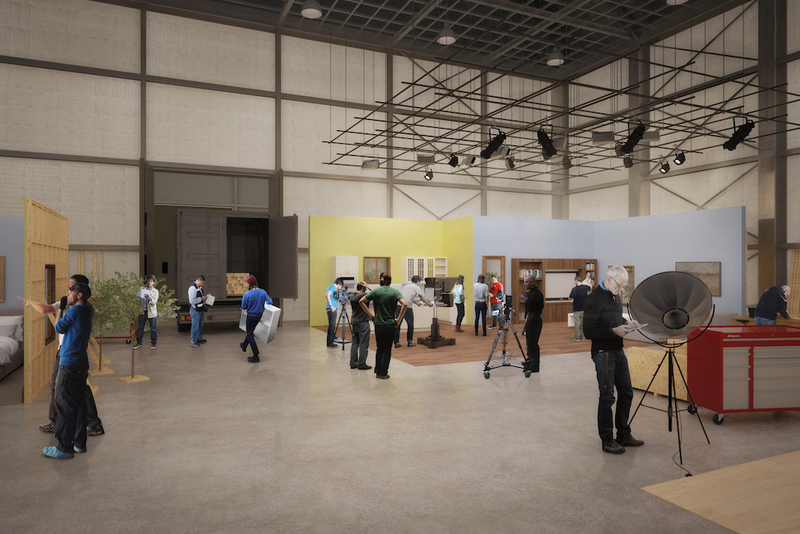 Designed by NY-based architecture firm WXY, renovations at two existing buildings will create nearly 200,000 sq ft. of garment manufacturing space, while a newly constructed 100,000 sq ft. film and television production facility is also in the works. Film and television production is one of the fastest growing high-wage job sectors in New York City. Last year 336 feature films were shot in NYC, up 40 percent from the year prior. This rapid growth has left many film productions struggling to find new and affordable space. 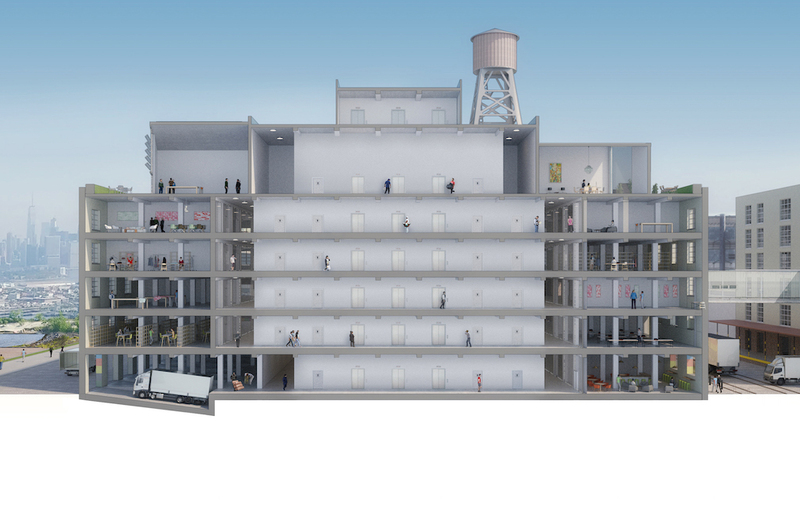 The Made in NY campus will provide high-ceiling sound stages for film and television productions, as well as emerging media sectors such as Augmented Reality and Virtual Reality. With average salaries of $57,000 in the fashion industry and $53,000 in the film production industry, the City says these jobs provide long-term career opportunities for New York residents. The City also promised to ensure hiring and workforce training for local Sunset Park residents to have access to jobs at the terminal. Expected to open in 2020, the waterfront campus will be connected to Sunset Park’s 43rd street corridor and is to be capped off with a 7,500 sq ft. food retail and manufacturing building. The City said it is currently looking for a tenant to provide affordable food and beverage options to campus businesses and the larger Sunset Park community. The expansion of Bush Terminal follows NYC’s $115 million investment in Brooklyn Army Terminal, expected to open in Sept. 2017, which will house 500,000 sq ft. of new industrial space.